Los Angeles, and David Holmes is in a recording studio finishing off the Primal Scream album. That’s going well but he’s simultaneously working on the soundtrack to the Good Vibrations film, working to a small budget. Some of the songs have been written straight into the script, so there’s no issue with Hank Williams, Rudi, The Undertones and The Outcasts. That still leaves plenty of space, but the setting of a record shop is the perfect chance to be bold. Why deal in the obvious – your Bob Marley, your English punk – when Terri Hooley’s ears might be resounding to Lee Perry and The Upsetters, to Bert Jansch, The Small Faces or The Saints? So David is grafting each morning on this mission, downloading the new rushes from Belfast and matching them up to the tunes that he keeps filing away. But there’s an abiding problem with the end title music. It needs to be something iconic – the big sayonara to this emotional story. A possible contender has been ‘Gloria’ by Them, but it’s just not achievable. Then Bobby Gillespie comes up with the genius suggestion. ‘Star’ by David Bowie. Right at the heart of ‘Ziggy Stardust’ album from 1972. A song about change and energy and the empowerment of rock and roll. It was a crash course for the future punks and Bobby Gillespie has also sussed those weirdly prescient lyrics. Wow. But not on this budget, David reckons. However, Bobby knows somebody in the Bowie camp. Calls are made and within three days there’s an answer. Bowie likes what he hears about the film, he doesn’t need the cash, so he’ll donate the track and the fee will be nominal. And so Good Vibrations gets the send-off it deserves. I’ve heard bits of this story before but a meeting with David Holmes and Terri Hooley in Broadcasting House, Belfast provides more of the detail. We’re looking ahead to the release of the soundtrack and talking through the tunes. Terri is remembering the day his lost his eye on Garnerville Road and the spectre of Hank Williams was wailing ‘I Saw The Light’. He’s also choked when he talks about the Shangri-Las and how ‘Past Present And Future’ coincided with the death of a young friend – one of the dead, adored girls of east Belfast. He literally felt that he might never love again, just like Mary Weiss told it. The Hooley-Holmes dynamic is a peculiar one. Two passionate and contrary music heads, both loaded on the detail and the visceral power of vinyl. They understand that records are life-changers and analogues for intense feeling. As a young mod, David would buy some of his old soul compilations from Good Vibrations, compiled by Ady Croasdell for Kent / Ace Records. 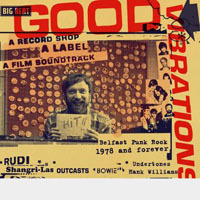 So it’s totally appropriate that the Good Vibrations soundtrack has also been prepared for release by Ady on Ace Records. Some of the tracks have an interesting provenance. There was a Ruefrex track on the old Shellshock Rock film called ‘The Perfect Crime’. But the track was never properly recorded and the live version on the punk documentary wouldn’t hold up. So David hired in his friend Jason Falkner, sometime player with Jellyfish, Air and Beck, who translated the scuzz of the Shankill Road to another register. The Terri Hooley / Richard Dormer performance of ‘Laugh At Me’ at the Ulster Hall is the soul of a city, invincible and true. But the soundtrack music was actually recorded in Los Angeles with a load of crack session players, all playing live together on the old Sonny Bono tune. For David, it was like one of the famous Wrecking Crew encounters, when Phil Spector would persuade the best players to bottle magic. Ah yes, Phil Spector. He was 17 when he recorded ‘To Know Him Is To Love Him’ with the Teddy Bears, a line taken from the tombstone of his father Ben, a suicide. Then in 1976, some school kids from the Langley Schools District in British Columbia recorded a sweet version. For David Holmes, this recording would play a critical part in Good Vibrations, the scene when Terri is being beaten up in the shop by paramilitary boneheads. Irony and sorrow and transcendence. I’ve been with Terri in the cinema a few times and he always wells up at this scene. Like you would. An hour in the radio studio with these two can barely contain their personalities. They bicker and undermine each other. They enthuse and then disagree. At one point, David is trying to explain the rapture of hearing a great song for the first time. It makes you want to hug a friend, the give them a high five, to hit them on the arm. With this, David biffs Terri, just below the shoulder. There’s an involuntary shout, but little more. However, it’s another story that’s becoming embroidered by the Hooley fancy. A few days later and someone stops me on the street. 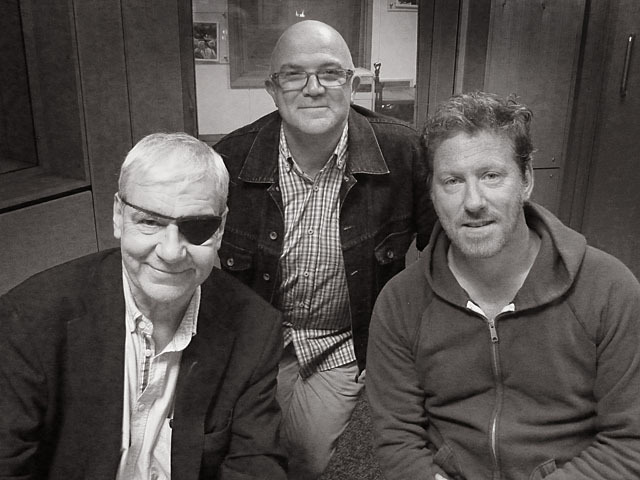 Listen to Terri Hooley and David Holmes talking about the Good Vibrations Soundtrack on The Late Show with Stuart Bailie, BBC Radio Ulster, 26 August, 11pm.